When one day on the lake just isn’t enough, you’ll want to spend a week (or more) at the nationally-rated Vineyards Campground & Cabins. The peaceful setting by the historical Cross Timbers Forest and accommodating staff will immediately win you over. Cozy, fully furnished, lake view cabins and full hook-up RV sites with spacious pull-throughs give you options so you have more time to focus on the huge trees, nature trail, private, sandy beach, beautiful grounds, fun events, playground, and fishing pier. 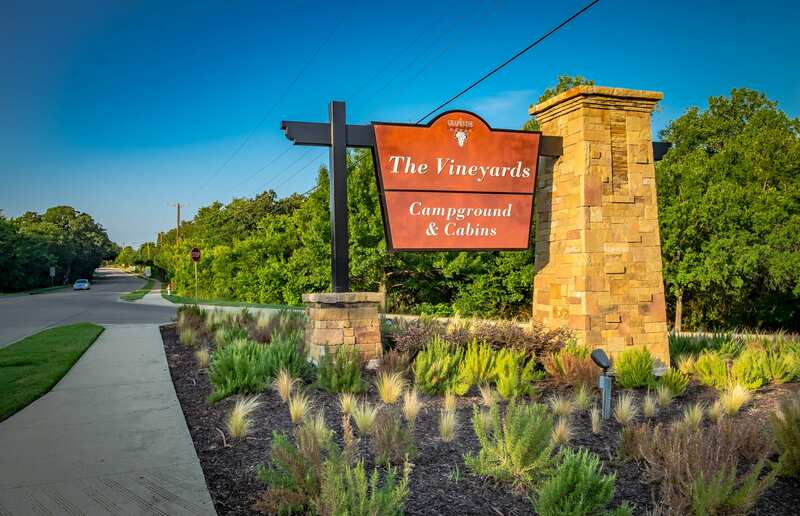 For your convenience, Vineyards offers kayak, bike, and golf cart rentals, as well as free wi-fi, a laundromat, and a wide selection of camping supplies, firewood, Vineyards clothing, and personal gifts in the Camp Store. Downtown Grapevine is only minutes away and offers a variety of entertainment venues, restaurants, and fun for all ages.